Nokia today announced that it has started shipments of the Nokia N72, a sleek and stylish multimedia computer. In pearl pink or gloss black, this compact package has high-perfomance multimedia at its core, wrapped in a beautiful design. The Nokia N72 offers the benefits of versatile photography, entertainment and personal productivity to people who value style as much as high performance. A powerful yet stylish multimedia device, the Nokia N72 is equipped with a 2-megapixel camera and integrated digital music player, with dedicated capture key, music player key, an integrated browser, FM radio and support for Visual Radio. 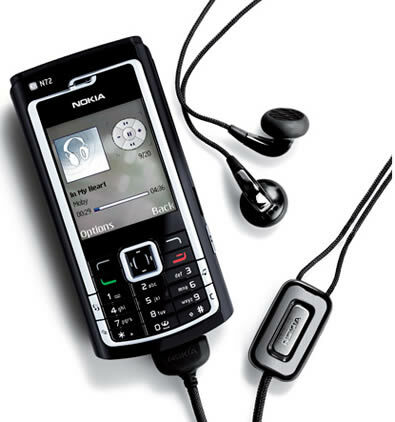 Personalize your Nokia N72 with a choice of digital music tracks, and enjoy music on the go with the integrated digital music player. Press the music player key for direct access to your music tracks. Rip music from your CDs, create playlists and transfer your music onto your Nokia N72 with the Nokia Music Manager, a part of Nokia PC Suite. Morph your Nokia N72 into a digital camera by sliding open the active lens cover and compose your shot using the high definition 2.1 inch colour display. The 2 megapixel (1600 x 1200 pixels) camera includes an integrated flash, which will make it easy to capture images even in low light conditions. Capture photos or video clips with just one click, and later personalize your gallery image collection with the integrated photo and video editor. Choose your favorites to print or transfer them onto a compatible PC, with the option of online sharing on select Internet communities. Matching themed headset and wrist strap are included in sales packs of the Nokia N72. The Nokia N72 has started shipments to key markets worldwide, including the Middle East and Africa, Russia, Eastern Europe, mainland China, India, Indonesia, Singapore, Thailand and Vietnam.